The finish for exposed metal parts shall be Black Powder Coating (Mirror Black), or hot dipped galvanized. (Galvanized has additional cost). 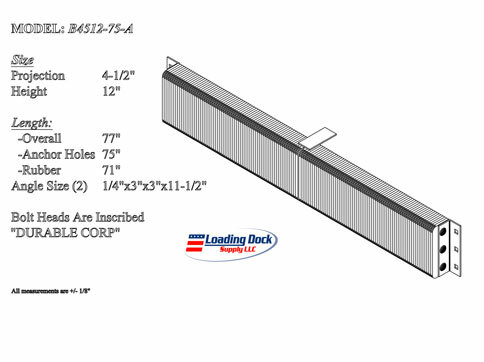 Open loading docks - Open loading docks are prone to damage from trucks missing the intended docking postition. To prevent concrete damage a continuous extra length bumper provides the highest level of protection for your facitlites loading dock. Dock Seals and Refrigerated Warehouses - Dock seals while ideal for the sides and top of a door are prone to air flow from the bottom of the door. To properly seal the entire door an extra length dock bumper provides the ideal combination of 80% impact absorption and total coverage across the base of the door. Ask about our custom lengths.